Digital Subscriptions > Gay Times > December 17 > IN CONVERSATION WITH ARMISTEAD MAUPIN. IN CONVERSATION WITH ARMISTEAD MAUPIN. The “there “ he is referring to isn ‘t just the creation of his beloved series of novels set in San Francisco, Tales of the City — the first of which was published in 1978 and last in 2014 — but the juxtaposing aspects of his life. As Armistead recounts in his recent memoir, the bittersweet, candid and explicitly funny Logical Family, he grew up in the conservative southern state of North Carolina. His father was a supporter of the Confederacy, a white supremacist and homophobe, and Armistead adored him, blindly following his father ‘s footsteps into early adulthood. As the longest-running LGBTQ publication in the world, our heritage is deeply important to us. We’ve come so far as a community, and it’s important to recognise and reflect upon the people who have helped us to where we are today. 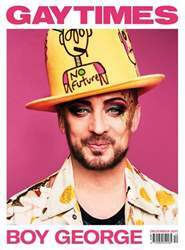 While evolving with the times in order to better serve our wider community, it felt fitting that the first cover star of our rebrand should be Boy George. Not only because he himself has undergone many evolutions throughout his illustrious career, but also because we’re celebrating the 30th anniversary of his first Gay Times cover. Adam Lambert sat down with Boy George to discuss his upcoming Las Vegas residency, releasing new music with Culture Club, finding inspiration to write music, his desired collaborations and his magnum opus. They also reflect on how his life has changed since he first covered Gay Times 30 years ago. Elsewhere in the issue: Jodie Harsh on the shrinking of London’s queer nightlife; Aidan Faminoff on his coming out story; The Gay Times Honours; Henry Holland and poet Max Wallis on their upcoming collaboration plus fashion, culture and opinions from around the world. This issue also features a collection of essays and poems penned by individuals from all pockets of our community. Welcome to the new Gay Times. GIDEON MENDEL ‘S THE WARD. A PERSONAL JOURNEY TOWARDS MARRIAGE EQUALITY IN AUSTRALIA. COMING OUT FOR THE GAME. A SPACE HOPPER FOR ONE. TRICK A KISS IN TIME. HENRY HOLLAND ‘S TOP EIGHT. I JUST WANNA BE LOVED. MISTER MAN, FULL OF LOVE.